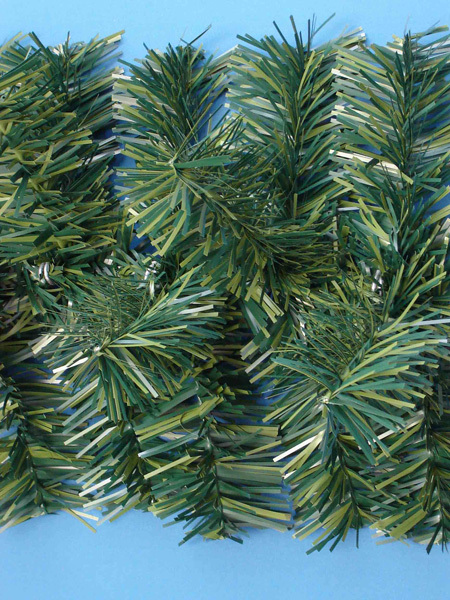 Realistic and incredibly durable, our high quality branch garland will help create a very sophisticated, festive look. Available in whatever length you desire, they look great plain or decorated with bows, flowers, shiny bulbs and just about anything you can imagine! Also available with lights at $9.00 per linear foot - just contact us. Our garland contains more material than any other manufacturer of external garland in the industry.We use a full 8 feet of two-ply, UV stabilized polyvinyl chloride (PVC) film to each foot of finished product for a fuller, brighter, and longer lasting product. Our garland is twisted around an annealed galvanized wire to prevent rusting and to enhance its flexibility. Our fine cut commercial grade garland is processed with an inner web equaling 10% of its final diameter resulting in its outstanding durability and longevity. These quality features are why the manufacturer offers its three (3) season warranty under normal conditions of use and service.